No one saw this? I thought it was good and I recommend it. It was good, but a fictionalized take in the story, apparently increasing the attraction and relationship between Elizabeth and Olive, while downplaying the preparation William put into the initial pitch for Wonder Woman. I watched this first, then watched “The Truth About Wonder Woman” (episode recap from one of the interviewed experts) on Robert Kirkman’s Secret History of Comics (IMDb), which I think was a good way to go about it. The movie sells the story of William, Elizabeth and Olive, empowering them all in the telling and showing (though Olive is portrayed as the submissive, naive youth there), while the mini-documentary focuses on William as the general instigator (with Olive as the one to introduce kink to William, which he was interested in but didn't know was a thing). The mini-doc implies that there is very little recorded about the relationship between William, Elizabeth and Olive, so the movie might be filling in some substantial gaps. One of Olive and William's grandchildren says that her father knew very little for most of his life about the actual relationship between William and Olive, and that Olive wanted to protect her kids from the secret to the point that it was Elizabeth who told the son, then a man, about who William was to him. The mini-doc also covers the full history of Wonder Woman, giving William (with Elizabeth and Olive in various supporting roles) credit for making Wonder Woman a feminist, a feature she lost when anyone else wrote her stories, until the 1970s. 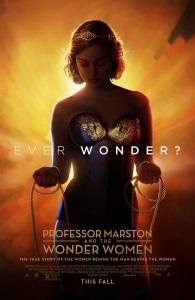 The re-discovery of feminist Wonder Woman was in part thanks to Gloria Steinem, who grew up reading Wonder Woman, and re-introduced the original, powerful character in the first issue of Ms.
Tulane sociologist Mimi Schippers says it better than I can, but I adored this movie.